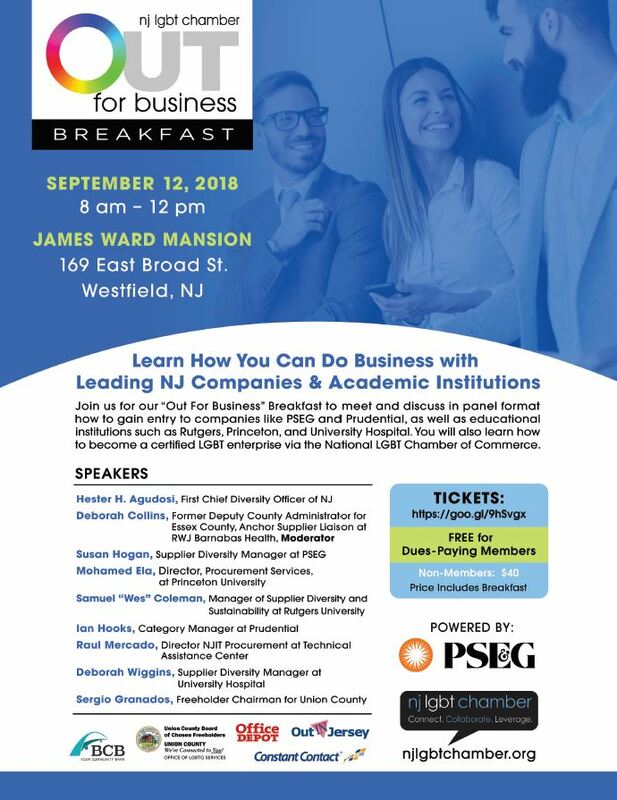 Union County, NJ – The Union County Board of Chosen Freeholders is proud to support LGBTQ and ally business owners at next week’s “Out For Business” Breakfast presented by the New Jersey LGBT Chamber of Commerce in partnership with PSEG on September 12, 2018 at the James Ward Mansion in Westfield from 8:00 AM until 12:00 Noon. Tickets are still available through the NJ LGBT Chamber of Commerce at http://bit.ly/NJLGBTChamberBreakfast18. The “Out For Business” Breakfast is a business and networking event designed to connect LGBTQ entrepreneurs with key contacts and decision makers from various businesses and Fortune 500 companies in New Jersey. Guests will have the opportunity to meet and discuss in panel format strategies that meet the diversity needs of companies such as PSEG and Prudential, as well as educational institutions such as Rutgers, Princeton and University Hospital. To succeed in business today requires strategic focus, the vision to see and then seize opportunities when they arise and a strong, accessible network of contacts. As an Affiliate Chamber of the National LGBT Chamber of Commerce, it is The NJ LGBT Chamber’s mission to bring together chamber members and allies with resources from across the business spectrum. The NJ LGBT Chamber of Commerce “Out For Business” Breakfast event is sponsored by PSEG along with support from NJ LGBT Chamber founding sponsor BCB Bank and additional partnership with Office Depot, Out In Jersey Magazine, Constant Contact, the Union County Board of Chosen Freeholders and the UC Office of LGBTQ Services. Established as part of Chairman Granados’ 2018 Moving Union County Forward initiatives, the Office of LGBTQ Services, under the Division of Outreach and Advocacy in the Department of Human Services, is the first County government office of its kind in the State of New Jersey – and one of four government offices in the nation to support the LGBTQ community, of which only two are county government offices. Union County’s Office of LGBTQ Services offers a platform for leadership and collaboration to support equality, and serves as a catalyst for advocacy, awareness and action on current and emerging issues that impact the lives of lesbian, gay, bisexual, transgender, and queer individuals. For more information about the Office of LGBTQ Services, contact Danni Newbury, Coordinator, at 908-527-4742 or dnewbury@ucnj.org or visit ucnj.org/lgbtq.